Stock Market Bulls Prevail – for Now! 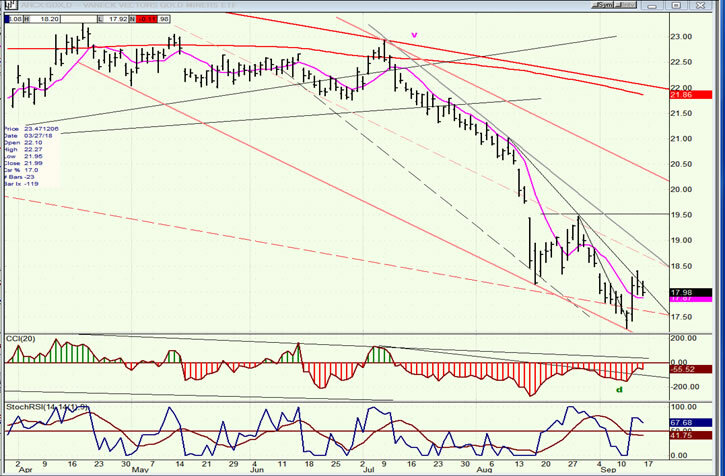 Intermediate trend – Another correction has started which could conceivably continue into mid-October. Bulls Prevail – for Now! After reaching a new all-time high of 2916 on 8/29, SPX started to correct until it came to a good support level which was further buttressed by an important short-term trend line (from 2700). The decline merely skimmed the surface of support before reversing -- a sign of continuing strength. By the end of the week, prices had recovered to 2906 where they appear to be stalling. The plausible forecast issued last week called for a correction starting at 2916 in the form of an a-b-c pattern which could last into mid-October. To date, there is nothing to confirm or nullify this forecast although, so far, the pattern is evolving as anticipated. Next week will decide if we reached the top of the b-wave on Friday and are about to start wave-c. The reasons for this correction remain the same: weak seasonal factors compounded by tariffs uncertainties. As we will see when we analyze the charts, indicators appear to support the fact that last week’s rally was weak and not likely to extend to new highs before some additional correction. This is reinforced by the tepid performance of NDX and IWM. 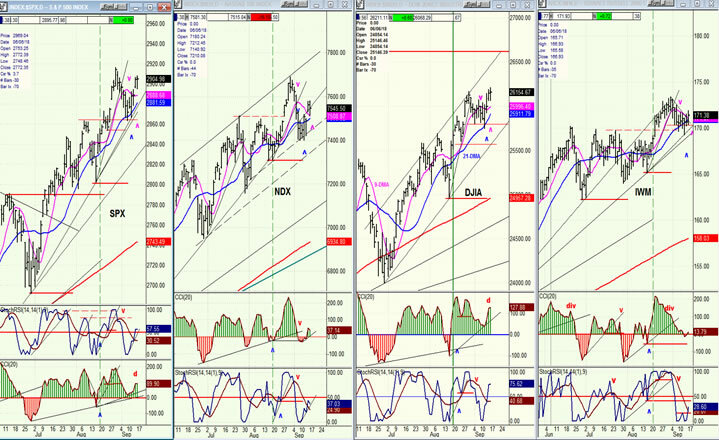 The support area which stopped the decline is identified by two parallel dashed red lines. As noted earlier, prices barely touched the top of this level before rebounding. It also stopped shy of the trend line from 2700. Although it is still considered to be a short-term trend line, it is still of significant length. The market action has made it even more important, because we would now have three touch-points, and if the decline were broken, it would (supposedly) be even more meaningful. Although, I suspect that, in this case, if prices did break through it, they would find support on the next rising trend line below. 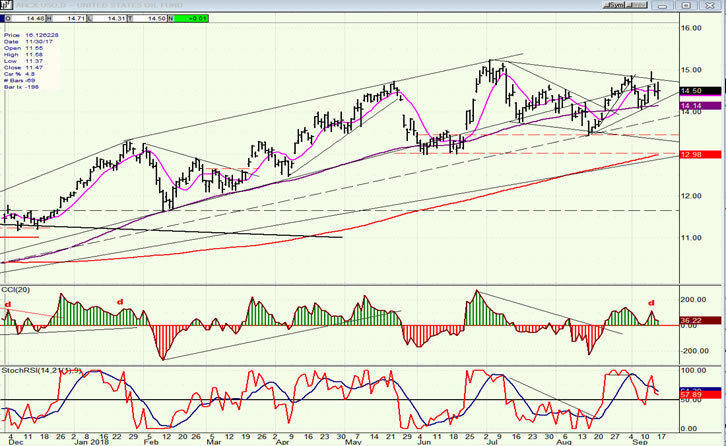 We can see that the rally stalled on Friday. Even though the index did make a slightly new high for the day, its range also extended slightly below Thursday’s low. This was due to a statement by Trump regarding tariffs. Hesitation was also somewhat due to this being Friday, and who knows what comment might come from this unpredictable administration over the week-end! The oscillators also reflect uncertainty. Although the top one (CCI) remains positive, it ended the day well below its recent high. The other two were essentially neutral. 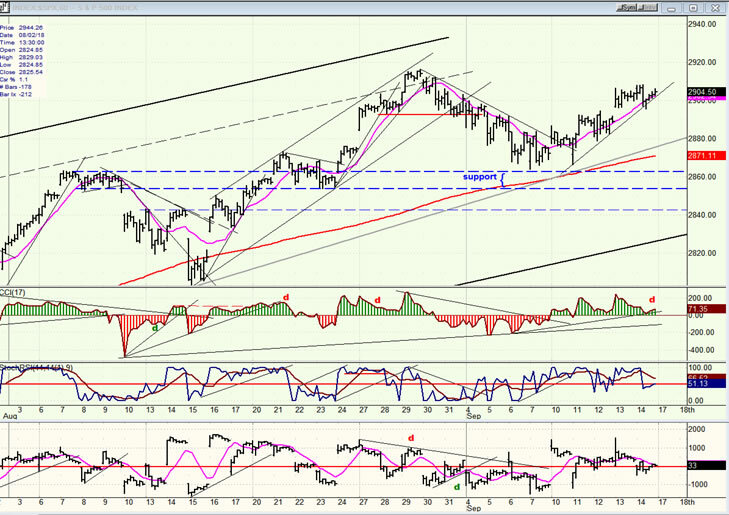 That, and the price action, suggests that the momentum of the recovery rally came to a stop on Friday. We will have to wait until Monday to see if it resumes on the upside, or rolls over. The rally which started from the top of the support level five days ago looks like an upside down replica of the decline which preceded it: simply a staircase pattern of higher highs and higher lows. Just as the downtrend did not reflect much weakness, it does not reflect much strength. Each move has been characterized by a two or three-hour bounce at the opening of trading, followed by a sideways move for the rest of the day. Friday’s high came within 10 points of the former top, but this may be all we get before reversing again. At the end of Friday, the hourly oscillators were similar to the daily ones, with CCI (top) slightly positive while the other two remained neutral. With September/October typically showing seasonal weakness, the odds appear to favor three or four more weeks of decline ahead. 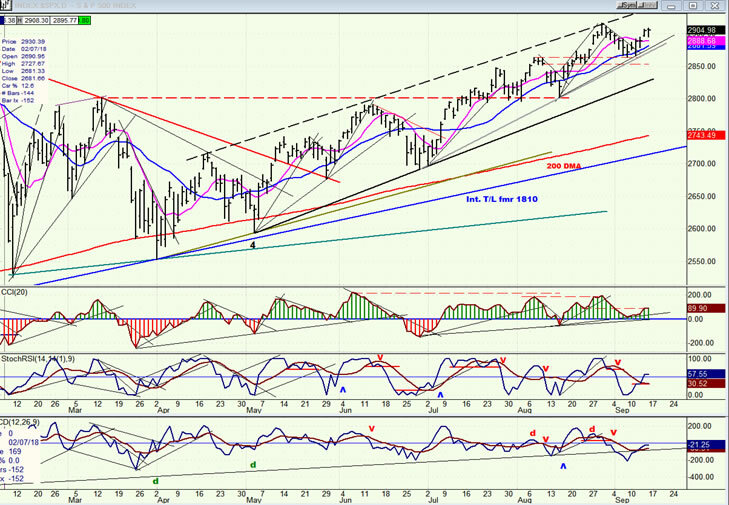 Last week, DJIA made a recovery high by thirteen points, and that helped SPX to rally also. NDX and IWM also rallied, but less aggressively with IWM being the laggard and participating only after making an intra-week low. I would think that if the market were on its way to making a new high, IWM would be in the lead, as it was just before SPX made a new high of 2916. Since then, however, it has receded to the role of a reluctant follower. UUP is not anxious to correct, and it may not until this whole tariff business is over. I had thought that it would come down to 25.00 and start a new distribution pattern on the P&F chart (1/2 point reversal), but it has thus far remained above 25.00. Since the entire base calls for a new high of 28.00, it may get there without any further consolidation -- especially if the trade war continues to escalate. While GDX had an uptick from its low, I don’t see it making a substantial recovery as long as UUP remains strong -- unless historical patterns happen to be changing. At the very least, GDX should build a base at the level of its current low (and it may even need to go a little lower) before starting that process. Of course, if the trade conflict is resolved quickly, this would speed up the index’s recovery. 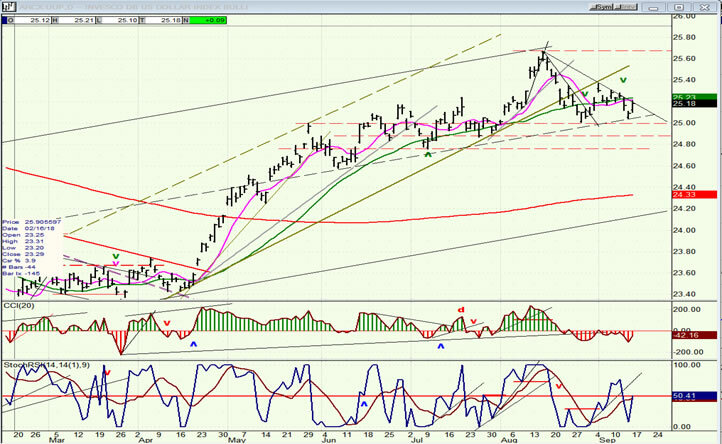 USO is holding up well, but I would not rush it, and the chart would would look much better if it corrected down to about 13.50 again before attempting a recovery high. Last week, I had suggested that SPX could have an a-b-c correction before resuming its long-term uptrend toward its final bull market high of 3000+. If last week brought us wave-b, we should now be ready for an extension of the correction into mid-October in the form of a c-wave.